Carolyn Moore (center), Hospice of Fayette County marketing and fundraising Coordinator, is pictured with Mark Underwood and Cliff Rhoads, owners and Brew Masters of Pour Boys’ Brew House during a recent donation to Hospice. Hospice of Fayette County was Pour Boys’ Brew House “Pints for a Cause” organization for the month of July. Pour Boys’ donated 10 percent of July’s Pour Boys’ brewed beer sales to Hospice of Fayette County. “We are truly grateful and appreciate being chosen as the recipient of July’s ‘Pints for a Cause.’ These funds will greatly help in supporting the patients we serve in our community,” said Carolyn Moore, marketing and fundraising coordinator for Hospice of Fayette County. In total, $527.74 was donated from the Pints for a Cause. Pour Boys brewery started in January, but the restaurant has been open since 2014. Hospice of Fayette County is a local, nonprofit agency founded in 1987, that never bills a patient for care or supplies provided relating to their illness. For more information on care and services, please contact Hospice of Fayette County at 740-335-0149. Additionally, visit http://www.hospice-fayco.org/ for more information about the organization, its patients and more. 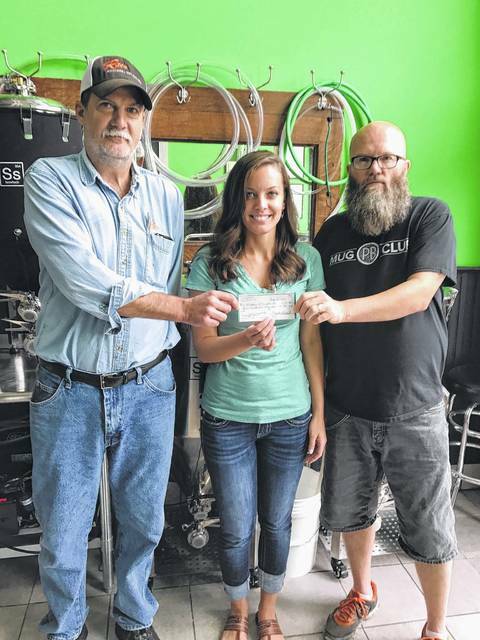 https://www.recordherald.com/wp-content/uploads/sites/27/2017/08/web1_pints-for-a-cause.jpgCarolyn Moore (center), Hospice of Fayette County marketing and fundraising Coordinator, is pictured with Mark Underwood and Cliff Rhoads, owners and Brew Masters of Pour Boys’ Brew House during a recent donation to Hospice.